Our after-hours emergency hospital is located in Lee’s Summit and serves southeastern Kansas City. When you have a pet emergency, seconds count. We want you to know, we’re ready for you at night and on weekends, when your primary care veterinarian might be closed. 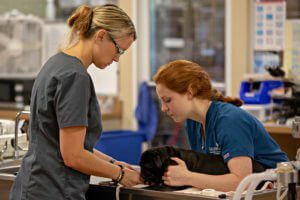 Our experienced team of veterinarians, vet technicians and support staff work closely together to provide the comprehensive, compassionate care your pet needs and deserves. Our Lee’s Summit hospital is open after hours and weekends when your primary care veterinarian may be closed. We’re also open on holidays. Specialty Care: Our Lee’s Summit hospital is an emergency hospital, but we work closely with board-certified specialty veterinarians at our sister hospitals in the Kansas City Area, in Northland and Overland Park. Our state of the art, 6000 square-foot emergency pet hospital stays open when you need the service most, at night and on weekends. We have an intensive care unit to help your pet in a time of need. In the morning, we will work with you to get your pet transferred home, or to another hospital or your primary care veterinarian. 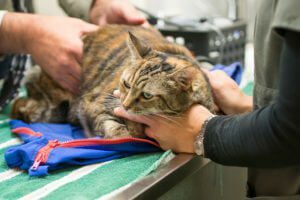 We are fully equipped as an emergency vet hospital, and we are one of three BluePearl pet hospitals in the Kansas City area.